Austin Creek State Recreation Area offers hikers and equestrians a refreshing sense of isolation and over 20 miles of rugged and remote terrain, featuring oak woodlands, grasslands and chaparral. 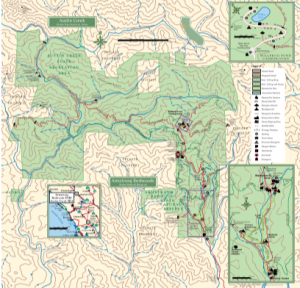 Trail elevations in this approximately 5,683 acre park range from 150 to 1500 feet, so hikes here are more strenuous than at neighboring Armstrong Redwoods. The extra effort is rewarded by stunning hilltop views and abundant plant and wildlife. Spring is a particularly good season here, as wildflowers are plentiful. Summer temperatures can exceed 100 degrees fahrenheit on the exposed hillsides, but deep, cool, tree-lined ravines and creek beds offer welcome respite. Two backcountry trail camps, with fire rings, tables and an outhouse, are available seasonally (permit required), along with 22 family campsites at Bull Frog Pond (at the end of the park road). Parking, camping, and backpacking site fees are charged. Bikes are allowed on paved and service roads ONLY. Dogs are allowed only on paved roads. Equestrian access is seasonal and based on trail conditions. Call ahead. For the most up-to-date information please check the official Austin Creek State Recreation Area website. For camping information at Bullfrog Pond or the backcountry trail camps visit the Stewards of the Coast and Redwoods website.